The quest for excellence and love for nature has always been a passion of the Bulgari family and has brought about intense research and development of the different potentialities of the local terroirs, which have generously given back three different qualities of harmonious red wines. Giovanni Bulgari, chief executive of Podernuovo and the creative soul of this venture, is naturally drawn to all environmental issues, and considers respecting nature an essential element while creating his wine. Finding a balance and harmony by reducing carbon dioxide while processing the grapes is the company’s objective. 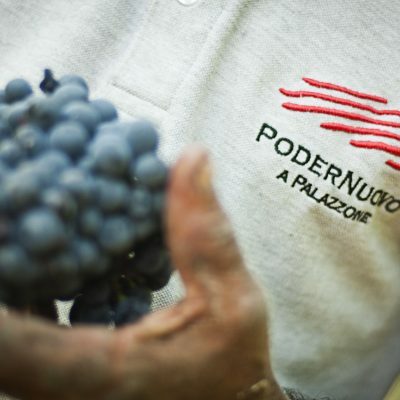 The company values are reflected in its logo, and specifically the vision and project of Podernuovo a Palazzone are an expression of Giovanni Bulgari’s love for streamlined and no-fuzz approach that is reflected also in the architecture of the winery designed by Alvisi&Kirimoto. It was a photography of Giovanni’s grandmother who owned a vineyard in the outskirts of Rome that inspired Alvisi&Kirimoto to propose the winery’s logo that combines extreme simplicity with great poetic content: soft brush strokes of wine create the rows of the vineyard. The Podernuovo estate is located in the hamlet of Palazzone, in the municipality of San Casciano dei Bagni, on the border between Lazio and Umbria. In the past Palazzone was a post office on the important Via Cassia, then it became a commercial outpost of the Fighine Castle, which is close by, and to which Podernuovo belonged. 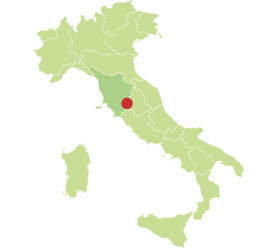 Today it is located in a protected triangle within Tuscany, where the land is still cultivated, and mankind has respected the balance of environment and territory, as well as its ancient farming traditions. The desire to listen, understand and interpret the values of the land, intended as a heritage and common good in syntony with the article 9 of the Italian Constitution, that cites: “The Italian state promotes the development of culture, of scientific research and technology. It protects the land and the historic and artistic heritage of the Nation”. This is, for Podernuovo, the aim from a human and from a management point of view: it is research, a daily effort to protect the environment, to produce the good but also the beautiful and healthy, to contribute to maintain the environment and the landscape, while spreading culture of all things well executed. Today Podernuovouses geothermal sources to heat and cool the entire wine production and aging process. Solar power plants for energy and a non invasive architecture guarantee a harmonic approach to the landscape.